It's getting chilly here in Florida, and I'm enjoying making apple dumplings and wearing my snowman sweater now and then. (I'm normally in flip-flops and shorts.) Facebook is full of gratitude posts, and I'm thinking of trying a new cranberry salad recipe for Thanksgiving. I love autumn. It's my favorite season. I was married in October solely because that's when trees show off their colors. I love the cool breezes in November and the fact that Christmas is peeking around the corner. I won't be posting again until Black Friday, so I wanted to share a few things I'm grateful for this year - outside of family and relative health, which I recognize every year. These are just simple things that make me smile. 1. My gym, where membership is only ten bucks a month. I don't make it there every day, so I appreciate the fact that I'm wasting only thirty-three cents on the days I'm not checking in. 2. My PT Cruiser. It fits my behind. 3. CVS weekly sales. Nothing beats .99 Puffs or Dawn dish washing liquid. 4. Skinny Cow ice cream sandwiches. We've gotten away from fat ice cream completely and don't even miss it. 5. Fresh salmon all year round. With maple syrup and a bit of lemon. I only wish it was thirty-three cents a day like the gym. 6. That Mom, who's fairly reserved, can still make me chuckle. Like the fact that she calls her pantiliners "ipads." 7. Coconut oil. It's a great moisturizer and, mixed with baking soda, a wonderful, natural toothpaste. 8. Dental hygienists and proctologists. No, really. What if no one wanted those jobs? Just imagine. Whatever they're paid, it's not enough. 9. Pocket calculators. I haven't had to do math in my head for a decade. And I wasn't very good at it then. 10. Can openers that take off the lid from the side, so there are no sharp edges. This enables me to use the lids and cans for all kinds of things. 11. Electrical tape. I've just discovered it's a super craft tape, and it comes in all kinds of colors. It enables me to make stuff like this. 12. My clothesline. I hang clothes out all year long. I feel like I'm pulling one over on the electric company. I'm sure it doesn't care, but it makes me feel like I'm smarter than the average bear. 13. IKEA. I love roaming around in that store. The plastic bag holder and the washcloths with loops on them make me so happy. 14. Flannel sheets. We use them all the time, even in the summer. Cotton sheets are crinkly and loud. 15. Cream of Mushroom soup. You just can't replicate that stuff. I've tried, and I've failed. I bought two cans today. Green Bean Casserole, I'm ready. 16. Those Liberty Mutual commercials where the tree drops on the car, or the car door gets snapped off by another car whizzing past - they crack me up every time. Humans. 17. Cookie cutters. I've collected all kinds over the years, and they bring such creativity and fun to sugar cookie dough. If I had to carve swans or reindeer by hand, we'd just have circle cookies cut out with a glass. 18. That God's graces are new every day. Because, everyday, I need a do-over. What a great message and reminder. So fun! 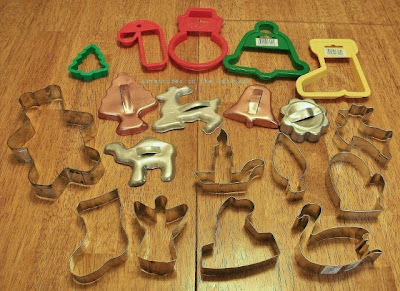 And your picture of the cookie cutters brought back sort of this rush of nonspecific nostalgia. We used to have that very same camel cookie cutter when I was little. When I saw it, I recognized it with this perfect, sort of visceral clarity. I don't remember a specific cookie-making incident, but I remember that cookie cutter. (We may have had the others with that set, but I don't remember them the same.) So thanks! That was lovely. Good reminder. Especially when every commercial I see on the tv, in the mail, etc., is about buying stuff. Buy buy buy! How about give give give instead (especially nonmaterial stuff)? Thanks. Jeanna, the camel cookie cutter! How funny our moms both had that. I've never seen one like it since. It's a difficult little sucker to frost, so I don't use it, but I've save it b/c it was my grandmother's.